Cadet Annie Anderson of Pamlico HS NJROTC is the State winner of the SAR Enhanced JROTC Cadet Award!! Congratulations Annie!! She and her parents will be invited to attend the Youth Luncheon at the Annual Convention in Raleigh on April 6 where she will be presented a $750 cash award, a silver framed ribbon bar containing a silver star for the Minuteman Medal drape, and a certificate recognizing her achievement. She will also read her essay to the luncheon attendees. The NC judges were very impressed with her essay. She will now go on to National competition where she will be a strong competitor. 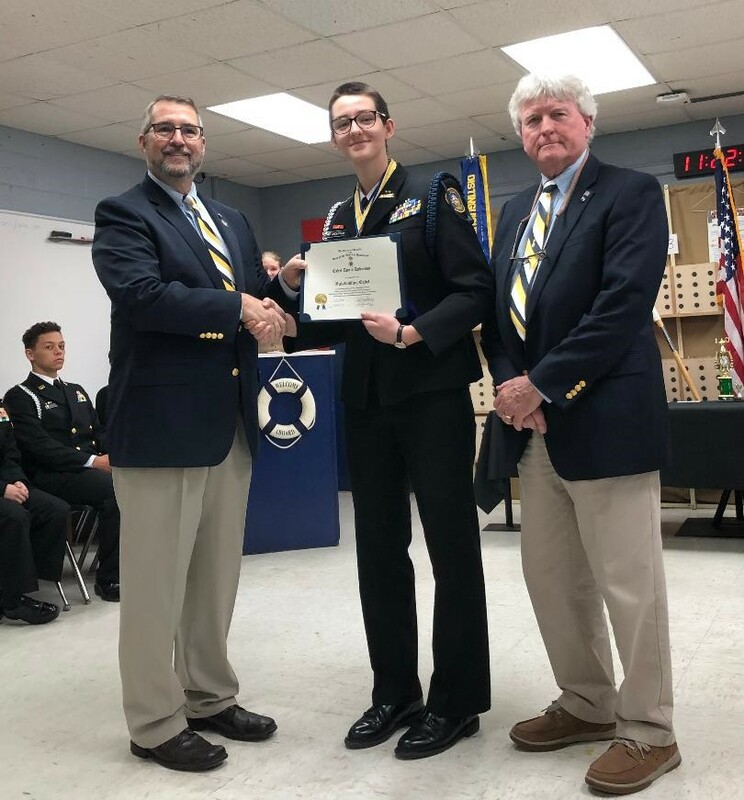 Hats off to Cadet Annie Anderson, her Naval Science Instructors Commander Mike Robinson and Master Chief Dave Matthews, and the entire Pamlico HS NJROTC unit! Pictured in the photograph are: Jay DeLoach, New Bern Chapter VP; Cadet Annie Anderson; and Dr. Bob Ainsley, New Bern Chapter Educational Programs Director.